After spending several days in Mae La Oop, I needed to do some laundry. I had noticed clothes hanging on lines in front of houses all over the village, but I wasn’t sure if there were washing machines. I wonder/worried that I might have to hand wash all of our dirty clothes. I asked one of the students if she had figured out what the laundry situation was and she said there was a washing machine at her homestay. I peeked around the back of the family’s raised hut and found that, yes, they also had a washing machine. The next morning I gathered our dirty clothes and took them around back to the washing machine. Hum, it didn’t look exactly like the kind of washing machine I was used to. There were 2 basins. One large and one small. I determined that the large one was for washing and the small one was for spinning the water out of the clean clothes. But how to turn it on? The labels were all in Thai. I turned the knobs first one way, then the other. Nothing. Suddenly Grandma appeared from around the corner. Apparently, she had seen me struggling. First, she stooped over the blue water pipes running along the edge of the yard by the rice field. Then she unhooked one piece of piping and attached it to the another. This caused water to come out of a pipe near the washer. The end of this pipe was covered in a black sock. Grandma picked up this pipe and began wringing the dirt out of the sock as the water flowed through it. Five minutes later the tub stopped moving. Grandma turned a different knob and the water began to drain from the tub. Once the water was gone, she filled the tub again with sock filtered water, added fabric softener, and set the tub to agitate for 10 minutes more. Once this was done, Grandma began draining the tub again. The water just ran out of the machine into the yard. She then gestured for me to put the clothes into the spin basket, showing me with her hands that I should shake the water off the clothes a bit when transferring them. Surprisingly, the whole load fit in the tiny basket. 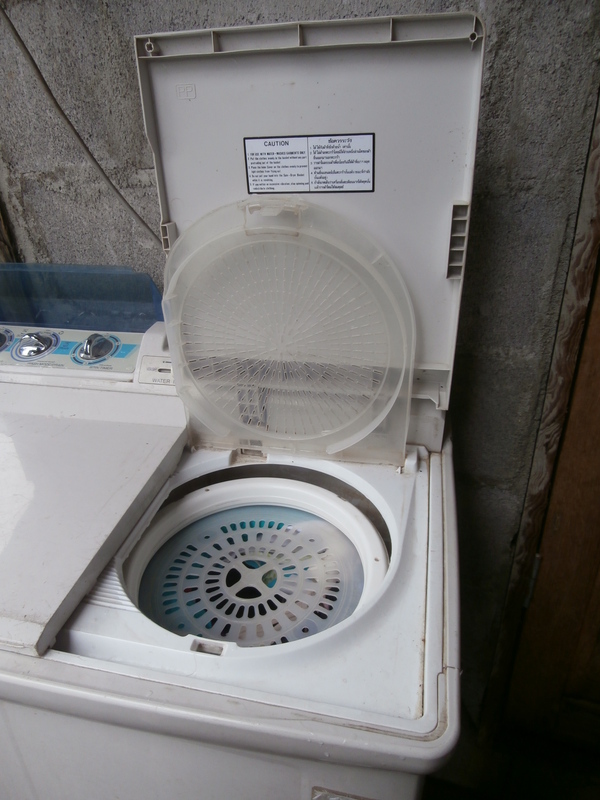 A white circular plastic piece was then pressed on top of the clothes and the lid was closed. The spinner was set for 2 minutes. The clothes came out with much of the water wrung out of them. The girls and I then hung the laundry near the family’s clothes under a wooden carport-like structure. 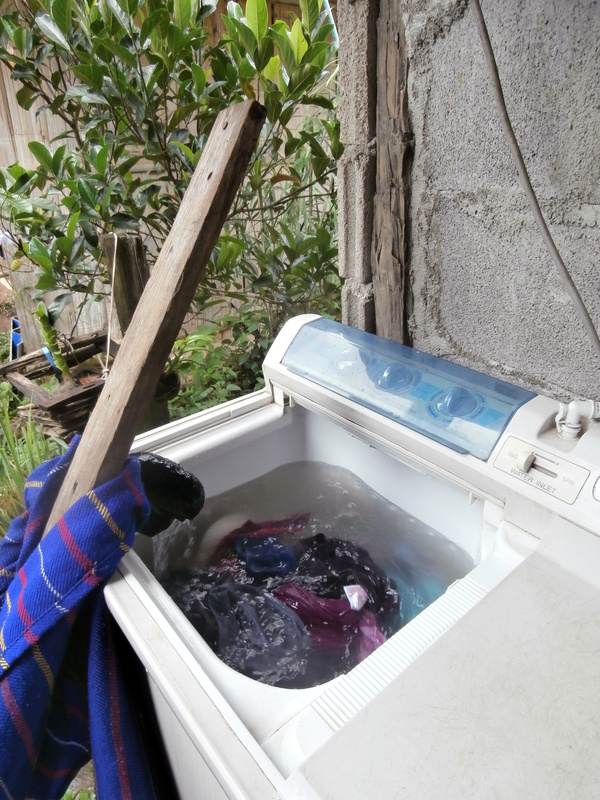 Because of the cool, damp climate it took a while for the clothes to totally dry. Later when the sun came out, I noticed that our clothes had been move out from under the carport to dry in the sun. I thanked our homestay mom for moving our clothes. A few hours later it began to rain. After it had been raining for about 10 minutes I remembered the laundry and ran over to move it, but it had already been moved under the carport again. I had no idea when I insisted on doing my own laundry that it would be such an adventure! I am grateful that our homestay family was gracious and willing to help a clueless American who couldn’t figure out how to do laundry in their village. Funny. I think that’s why they use a lot of fabric softener here, to cover up the fact that the washers don’t get the clothes all that clean.